It's time for a royal ball! 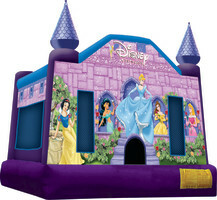 Little princes and princesses will love bouncing with Belle, Cinderella, and other Disney princesses in the Disney Princess Jump (Lg) at your next bounce house party. Dreams do come true when you can bounce under fairytale skies.